Yeah, BDG just made a GIF of where in the ride the On-Ride photo is taken. You can see the camera flash. Oh thanks! Totally missed that wasn't playing right on my phone, my bad. Can't wait to eventually get over there and get one! Those photos are gorgeous!! Thank you so so much for sharing your trip with us. Looks awesome! Absolutely fantastic TR! I have loved every photo. It looks like you all had a great time. I'm very late on this but your TR on Heide-Park hit the nail on the head by calling it the "Thorpe Park of Germany". I never thought they wouldn't bother at all with the Q-bot system and the single rider lines though, it was much less crowded than this when I went in April and they had both lines open (although they handled it very sloppily by for example not opening the Q-bot lines until after noon). Love the TR on Kolmården though. Makes me all the more excited for Wildfire! I am drooling uncontrollably at all the wonderful Wildfire shots. Hopefully a Sweden trip is in my future. This whole trip was excellent--and Wildfire was the perfect way to finish it. There's airtime galore, and the last corkscrew is particularly crazy! Garet wrote: I know this whole Europe trip has probably made you super tired of people asking you to compare coasters but I've got to ask after you said one of the best in your review video... is this now your favorite RMC or is it still to close to call compared to Outlaw Run, Medusa etc? Those wondering if Wildfire was really "that good".. The answer is YES. It was my favorite coaster on the trip. I rode Balder the next day and to me it couldn't compare to Wildfire, and many have Balder as their favorite of any kind of woodie. (Yes, I know they are different types, but still) That part where Robb says in the video something like "how is this legal" is my favorite part of the coaster... You seem to hang upside down for several seconds, while I'm sure it's probably about 1.5-2 seconds.. It's just a super reride-able blast and definitely worth a trip if you're in the area. Kolmarden looks like such a fun park and Wildfire looks incredible! And this... This is amazing! 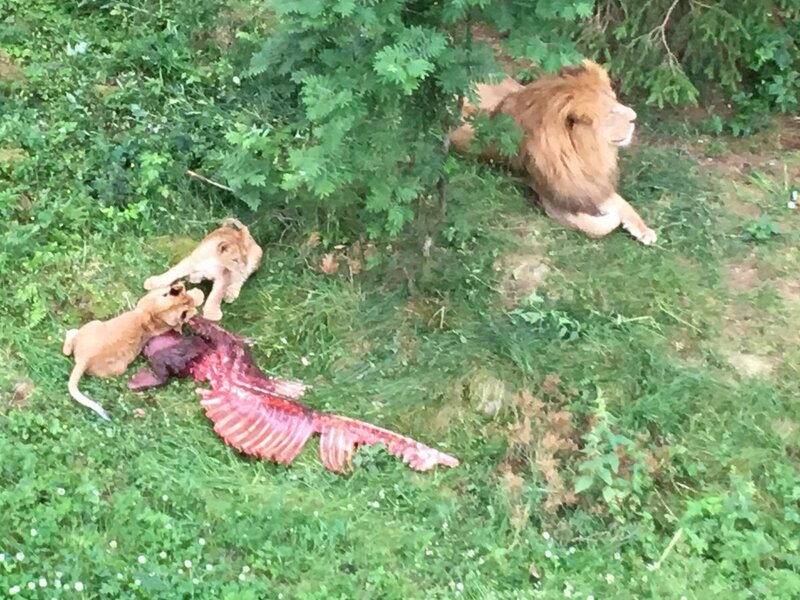 I've never seen animals in any American parks/zoos eating real animal flesh like this in such a natural form--it would always be processed meat or they would be fed backstage. Just awesome to see the cultural differences when it comes to visibility to certain things in these parks versus the US ones. Thanks for sharing!